Between Strep Throat and Pink Eye tearing through the daycare and my wife’s crazy work schedule, I was pretty late seeing this movie. But it finally happened! I had a ton of hype for this movie! With Hugh Jackman repeatedly saying that this was going to be his last time portraying Wolverine, we could all pretty much guess how this was going to end: Sadly for our favorite Canadian super hero. C’mon, other than Alpha Flight, who else do our friends north of the border have? Captain Canuck? The movie is loosely based on the incredibly successful Mark Millar mini-series Old Man Logan (which was awesome!) but had to be changed around, mostly because FOX does not have the movie rights to most the main characters from the comic (Hawkeye, Hulk, Red Skull and so on). Part of why Millar’s story was so successful was because the villains coordinated together, utilized all their strengths and won by tricking Logan into killing most the X-men (he believed he was being attacked by villains) then luring the other heroes into a trap. This gave purpose as to why Logan chose to leave society and never want to use his claws again. Who was this film really about? Who was this story of redemption really about? The killing off of nearly all the X-men is a huge pivot point in the X-men movie universe! Why re-work this so Xavier is responsible for this event and not Logan? Why take all the gravity off the title character of the film? 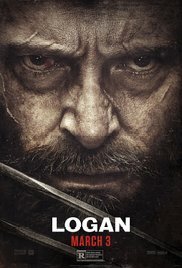 At times Logan was the supporting character of the film and literally the chauffeur for Xavier on Xavier’s quest for redemption. The fight scenes were great! All the combat scenes were fast paced and bloody! That is exactly what you expect from people fighting with razor sharp claws! I guess my only request is that there were more of these scenes. And an actual villain. Why use a corporate putz like Dr. Rice? I loved the idea of using high fructose corn syrup as a mutant gene sterilizer (right now I am eyeing my can of Mt. Dew very suspiciously…) and the lab where X-23 was created was all about DNA and cloning. How could DNA mastermind Mr. Sinister not be the villain!?! Unless there are other plans to use him in a future “X” movie. I liked the idea of bringing the Reavers (who once worked for Sinister by the way) in from the comics as the mercenaries. Although it was odd that lead Reaver Pierce (Boyd Holbrook) was seen repairing his cybernetic hand with no pain at one point, but was then in pain when the same cybernetic hand was shot later. We all knew a sad ending was coming, but wow, it seemed like it took a loonnnggg time to happen. And I guess that is my main issue with the film. The most distractingly depressing part for me was the slaughter of Will Munson’s (Eriq La Salle) family. Why? It served no purpose in the scene. The gravity of that scene should have been Xavier, the father of the X-men and reason they are extinct, being stabbed in the chest. Instead, that weight is distractingly distributed amongst him and a family we just met. For what? So Logan can be reminded that anybody her cares about dies? Hasn’t that already been established in the previous 7 storylines? I did like how the movie wrapped up. It had good closure for Xavier and Logan while still setting the table for the “New Mutants”. This was the 9th time Hugh Jackman played Wolverine (counting the cameo in X-Men: Days of Future Past) so there is no re-casting of Wolverine anytime soon. This meant Fox needed to pass the adamantium claw on to a whole new character which they did successfully. I previously read where some viewers were confused by where this movie fell in the X-Men movie timeline. I did not see the confusion since the timeline was more or less “re-set” at the conclusion of X-Men: Days Of Future Past. It’s not like The Flash were Barry Allen re-sets it 3 or 4 times a season. In the end, I liked a lot of what the director wanted to accomplish, just not sure he was 100% successful. Like I said previously, I did not leave the theater with a desire to see the movie again. Logan achieved a 3.5 on the Geeky Daddy Movie Rating scale and a sub Cannibal Holocaust on the Geeky Daddy Sidekick Scale. Side Note: This Logan is not to be confused with the American Girl Doll Logan…which is a real thing! Previous Too Drunk To Find Your Way Home? There Is An App For That (In Tokyo At Least)! Agreed that they needed back story. Good review. I lined how they wove it into the X-Men universe and showed the “new” mutants. I agreed about needing a better villain….for 2/ 3rd of the movie we get the reavers, only to trade off lead villain responsibility to Dr rice…I also didn’t like x-24 and the adamantium poisoning him…completely unnecessary. Yup be honest, what would’ve worked better for me is oohs they used a psychological trigger word and have Laura fight Logan.